What’s the Most Likely Source for Interstellar Travel? I’m currently reading an exceptional sci-fi book that I’ll discuss in a day or two. For now, I want to focus on a question raised by the book: What is the most likely source for interstellar travel? And, of course, there’s the least exciting option: We never figure it out, and we’re stuck slowly traveling within our solar system. If interstellar travel ever happens, I lean slightly towards the AI theory. We’ve done a pretty good job of getting computers to think independently, but we’re much farther behind when it comes to far-space travel. We’re still figuring out propulsion–we’re going to need a lot more than a few rockets to transport humans across the great expanse. The alien theory is fun and easy…almost too easy. Though it does echo certain elements of Earth’s history, wherein a vastly advanced culture discovers an much older, indigenous culture, and their level of technology instantly advances by hundreds of years. What do you think is the most likely source? This entry was posted on Monday, September 11th, 2017 at 9:34 pm	and is filed under books and tagged with books. You can follow any responses to this entry through the RSS 2.0 feed. 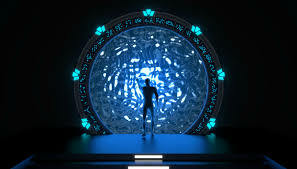 Discounting aliens, I believe one day we will be able to travel, however it most likely will be under conditions where it will take years to reach your destination and by the time you get there most people you know are gone due to relativity, and it being a 100 years later. Until we have that sort of interstellar travel, we aren’t going to have FTL travel, its all about the building blocks of science. Do you think it will be the sort of travel where the travelers are in some sort of stasis for long periods of time? I think we could do it if we actually put a concerted effort into it. Most efforts of our space program are devoted to exploring the solar system, because, frankly, there’s a lot we still don’t know about the nearest planets to home. I think it’s realistic to say that there could be an interstellar probe launched sometime in the next 50 years. You could send a probe the size of a smartphone with a solar sail and achieve the meaningful fraction of the speed of light required to get to another star in a reasonable amount of time. It won’t be able to stop when it gets there, but maybe a fast flyby will be enough to give us more reason to explore. But Humans are a problem. We need life support, food, air and water recycling devices, and space to live in. And we probably want to stop when we get there. Propulsion is a problem because all the forms we use today require way too much fuel, so you end up with a craft that is around 97% fuel. So if people need a habitat the size of a bus, you need 38 more busses to push it out of earth orbit. (Not exactly, but close enough). Getting to Earth Orbit is the “half-way point” to anywhere, and the best rockets are about 85% fuel, meaning you need 6 busses to get the people bus into orbit. and then you need 228 more busses to get the 38 busses of fuel into orbit. So now we’ve got 272 busses just to get the one bus to alpha Centauri. And it’s probably much higher, in reality. So we need some other kind of drive system that isn’t so inefficient. An antimatter drive might be able to get us more energy out of a smaller fuel mass, but antimatter is very unstable, and very expensive to come by. A reactionless drive (electric drive without fuel-mass) is something that people are working on, but it’s a physical impossibility under current understanding of physics. A warp drive, similar to what Alcubierre proposes would be great, but that requires some unique understanding of physics too. But then the final problem is, what do you do when you get there? It would almost have to be a one-way trip, which means you’d better have infrastructure set up before you arrive, and a planet to live on, or a space station, or something. But I think it’s possible, and I think it’s reasonable that we will get there someday, but we’re a long way off right now. I’m gonna go with humans craving the code on this one. While computers and AI are likely to lend us a hand on this one, they can’t (yet) think abstractly. Innovations like flight were due to man’s observation and injinuity not straight up math. Computers answer questions, not ask them. Interesting thought though. The other question is, does mankind get the credit if they create the AI that solves it? I’m sure that will be a debate, but I lean towards giving the AI credit (if it’s truly capable of independent thought far beyond human comprehension).